That portion of the nervous system composed of the brain and spinal cord. The brain is enclosed in the skull, and the spinal cord within the spinal canal of the vertebral column. The brain and spinal cord are intimately covered by membranes called meninges and bathed in an extracellular fluid called cerebrospinal fluid. Approximately 90% of the cells of the central nervous system are glial cells which support, both physically and metabolically, the other cells, which are the nerve cells or neurons. the principal part of the nervous system of animals and man, consisting of nerve cells (neurons) and their projecting parts (processes). It includes a system of closely interrelated groups of nerve cells (ganglia) in invertebrates and of the spinal cord and the brain in vertebrates, including humans. The main and specific function of the central nervous system (CNS) is to effect simple and complex highly differentiated reflexes. In higher animals and in man, the low and middle divisions of the CNS—the spinal cord, medulla oblongata, mesencephalon, diencephalon, and cerebellum—regulate the activity of the organs and systems of a highly developed organism, effect contact and interaction among them, and maintain the organism’s unity and the integrity of the organism’s activity. The highest divisions of the CNS—the cerebral cortex and contiguous subcortical structures—largely regulate the organism’s interrelationship with the external environment. vessels. All the divisions of the CNS have afferent neurons that receive stimuli from the periphery, as well as efferent neurons that transmit nerve impulses to various effector organs on the periphery. Afferent and efferent cells are able to interact by means of their processes and to form a two-neuron reflex arc that effects such elementary reflexes as the tendon reflexes of the spinal cord. In general, however, there are intercalary nerve cells, or interneurons, located in a reflex arc between the afferent and efferent neurons (see Figure 1). Contact among the different divisions of the CNS is also established by the numerous processes of their afferent, efferent, and intercalary neurons, which form short and long conducting pathways. The CNS also includes neuroglial cells that perform a supporting function and participate in the metabolism of the nerve cells. The reflex principle of CNS activity. The reflex principle of CNS activity was established experimentally before the 19th century but was studied only in relation to the activity of those divisions situated below the level of the cerebral hemispheres. Scientists dealing with the CNS elucidated the general mechanisms and the adaptive nature of CNS reflex activity, as well as the funtional characteristics of its divisions. In the 19th century, I. M. Sechenov and several other progressive scientists advanced the bold idea that the activity of the higher divisions of the CNS, including mental activity, was reflex in nature. This progressive, materialist idea was the basis of the classic experimental and theoretical studies of I. P. Pavlov that led to his theory of higher nervous activity. Pavlov established that the reflexes effected in highly developed organisms by the cerebral cortex, unlike the reflexes of the lower divisions of the CNS, are not innate but develop during the life of the organism as it interacts with the environment; the reflexes of the cerebral cortex enable the organism to adapt with maximum efficiency to its environment. Pavlov called this new class of reflexes conditioned reflexes, in contrast to innate, or unconditioned, reflexes. Rejecting the original, rudimentary view of the reflex as a stereotyped, mechanical, and passive response of the CNS, the classic studies of the neurophysiologists E. Pflüger, Sechenov, Pavlov, and C. Sherrington established that unconditioned and in particular conditioned reflexes are highly dynamic and changeable: responses to the same stimuli vary with external and internal environmental conditions and with the functional state of the CNS itself. The principal patterns of CNS activity are closely related to the characteristics of the reflex arc, which is the structural basis of every reflex action. The reflex arc conducts excitation in only one direction, from the receptor ending to the effector, owing to the structural and functional polarization inherent in all nerve cells. Microstructures called synapses, which are located on the terminal branches of each neuron’s axon, enable the neuron to come in contact with the bodies or the dendrites of other neurons and to transmit its activity to them unilaterally (the Bell-Magendie law). The diverse external and internal receptors have become specialized over the course of evolution in their ability to respond with precision to qualitatively distinct types of energy—luminous, acoustic, thermal, mechanical, and chemical. The receptors transform this energy during the process of nerve excitation, which is successively transmitted from some elements of the reflex arc to others in the form of rhythmic impulses. The excitation undergoes significant changes in rhythm, intensity, velocity, and character in its multistage journey to the final element. Reflex excitation may produce in the effectors a variety of effects owing to the structural and functional characteristics of the effectors (muscles, glands, or blood vessels) themselves. The functions of the central divisions of the reflex arc, in contrast to those of simple nerve conductors, are marked by a relatively slow onset and by the presence of excitation and of the phasic oscillations of the level of excitability that are produced by waves of excitation. This unique functional inertness—a relatively lengthy persistence of a state of high excitability—causes the phenomenon of summation (weak, ineffective stimuli become effective when repeated) as well as the related phenomenon of attenuation. The central elements of the reflex arc can change or transform the rhythm of stimulation. The resulting excitation usually occurs with its own inherent rhythm of waves, a rhythm that is sometimes faster and sometimes slower than the rhythm of initial stimulation. Between the force of stimulation and the intensity of the reflex response there is only a relative correspondence, which is ordinarily observed after moderate stimulation. If stimulation is strong and prolonged, the nerve centers become inhibited, in which case weak stimulation begins to elicit a greater reflex effect than does strong stimulation, a phenomenon known as the paradoxical reflex. A relatively high susceptibility to fatigue and pronounced sensitivity to biochemical changes in the organism’s internal environment, especially to an insufficiency of oxygen in the blood and to certain toxins, are also characteristic of the central elements of the reflex arc. All these traits are caused mainly by the properties of the synapses, dendrites, and bodies of the neurons themselves. A reflex arc is usually depicted in a simplified form, as a chain of individual receptor, afferent, intercalary, efferent, and effector cells. 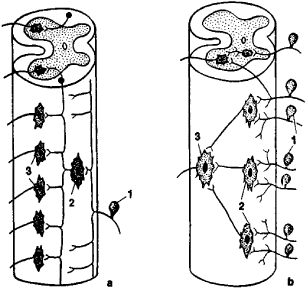 In reality, however, a reflex arc is composed of many such chains, whose links are not individual cells of various kinds but an aggregate of homogeneous interrelated cells. An aggregate of receptor cells forms the reflexogenic zone of a reflex, a group of effector cells constitutes the reflex’s operating mechanism, and an aggregate of neurons in the CNS forms a corresponding nerve center. Pavlov defined a nerve center as an aggregate of nerve elements situated in different parts of the CNS, closely interrelated, constituting a unified system, and regulating a specific function of the organism. Developing and concretizing this concept, E. A. Asratian suggested that the central part of an unconditioned reflex arc be regarded as a multistage structure consisting of several branches; each branch passes through one of the divisions of the CNS participating in the given reflex and is characterized by specificity (see Figure 2). 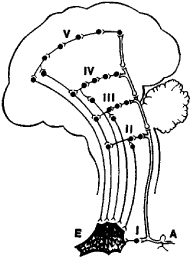 These branches are of unequal importance in effecting reflexes: the branches situated at some levels are used for certain reflexes, and branches at other levels are used for other reflexes. For example, the main branch of the arc associated with cardiovascular and respiratory reflexes passes through the medulla oblongata, and the main branch of the arc associated with digestive, defensive, and sexual reflexes passes through the diencephalon. The branch of a multistage arc that passes through the cerebral cortex corresponds to what Pavlov called the cortical representation of the unconditioned reflex, which is the basis for the formation of the corresponding conditioned reflexes. Coordination of reflexes. The CNS effects many diverse reflexes differing in their receptor, central, and effector mechanisms as well as in type, character, direction, origin, and degree of complexity. Nevertheless, these reflexes do not originate or occur in an uncoordinated or chaotic manner but have a specific composition, order, and sequence according to the organism’s current needs for unified, integrated, and adaptive activity. The coordinating activity of the CNS is determined by its structural and functional characteristics. The extent of genetic kinship among the different structural elements of the CNS and the nature of their interrelationship are important prerequisites for their interaction and for the coordination of reflexes. Of particular importance in this connection are the structural characteristics known as divergent and convergent pathways. Through the divergent pathways, the numerous terminal branches of the axons bring each afferent neuron in contact with many efferent neurons, either directly or through an intermediate neuron (see Figure 3,a). This makes it possible for a single afferent neuron to activate many nearby and remote efferent neurons and associated reflexes in a definite sequence. For example, moderate stimulation of the pad of the hind paw of a decerebrated cat initially elicits the reflex of flexing the talocalcaneal joint. Gradual intensification of the stimulating current elicits in succession the reflexes of flexing the knee joint and hip joint of the same extremity, the extension reflex of the opposite hind leg, the extension reflex of the homonymous front leg, and, finally, the reflex of flexing the opposite front leg. These reactions result from the gradual dispersion (irradiation) of the excitation arising in the afferent element of the primordial reflex to the related structures of the nearby and remote reflexes of the spinal cord by means of the short and long intraspinal conducting pathways. By means of the convergent pathways a number of afferent neurons are brought into contact with an efferent neuron by the terminal branches of the axons, either directly or through intermediate neurons (see Figure 3,b). In the latter case the branches of several afferent neurons converge on a single interneuron, which serves as a unique common pathway. The branches of several such interneurons in turn converge on a single efferent neuron or an aggregate of them as on a common terminal pathway, which is blocked to other currents of excitation. The convergence of pathways in the CNS makes it possible for a single efferent neuron to be utilized by many homogeneous and heterogeneous afferent neurons, which are several times more numerous than efferent neurons. For example, separate, moderate stimulation of two different regions of the receptive field of the scratch reflex does not elicit the appropriate reflexes. However, simultaneous stimulation of both regions by a current of the same force provokes a distinct reflex owing to the summation of subthreshold excitations. Mutual intensification of reflexes is also achieved by simultaneous stimulation of the receptive fields of two different reflexes that have a common terminal pathway and that produce the same effect. The phenomena of divergence and convergence were initially discovered and studied in relation to the activity of the spinal cord but were later found to exist in other divisions of the CNS as well, especially the cerebral cortex. Since afferent nerve elements greatly exceed efferent elements in the higher divisions of the CNS, the principle of the convergence of multiple pathways to the sensorimotor region, the main cortical common pathway, is quite pronounced. This makes it possible for afferent nerves to help effect various unconditioned motor reflexes and for diverse conditioned reflexes to develop from these unconditioned reflexes. Recently developed electrophysiological techniques have enabled such contemporary neurophysiologists as the Italian G. Moruzzi and P. G. Kostiuk to discover and study the micro-structural and microfunctional bases of individual neurons. These scientists have also identified and studied the mechanisms of divergence and convergence, particularly in neurons of the spinal cord, reticular formation, thalamus, cerebral cortex, and other divisions of the CNS. The body and dendrites of every neuron in the reticular formation and cerebral cortex were found to have synaptic contacts with numerous other neurons that are activated by stimuli of different modalities and that exert both excitatory and inhibitory influence on the common pathway. Such factors as the original functional condition of the nerve structures involved in a reflex, the force, biological role, and duration of the external stimulus, and the effect of internal neural and humoral factors are of considerable importance in the coordination of reflexes and in CNS activity. However, the main functional basis for the coordination of reflexes is the ability of the CNS to activate through excitation certain synaptic contacts and pathways and, in particular, simultaneously to block the inhibition of other synaptic contacts and pathways. These processes occur in a great variety of combinations and spatial and temporal relations according to the current needs of the organism and the existing conditions of the external environment. The key role of inhibition in the coordinating activity of the CNS is clearly manifested in the antagonistic interactions of reflexes, particularly when different receptors or receptive fields having a common effector but evoking different kinds of reflexes are stimulated at the same time. Such mutually inhibitory relations exist among locomotor, defensive, and delayed reflexes in which a role is played by identical extensor motoneurons and the muscles of the extremities innervated by them. Each of these reflexes may occur separately and without hindrance if only its receptive field is stimulated. But if the receptive field of another reflex is stimulated during one of the reflexes, or if the receptive fields of both reflexes are stimulated, a conflict ensues over the control of the common terminal pathway. The reflex that predominates is the one whose receptive field at the given moment is stimulated more strongly and the one that is more essential to the organism under the given conditions. The other reflexes are blocked by the inhibitory process, thereby creating favorable conditions for the unimpeded effecting of the overcoming reflex. Another example of such coordination of reflexes is the reciprocal innervation of the antagonistic muscles of the extremities and of the respiratory and other systems. Sherrington and the Russian physiologists P. A. Spiro and N. E. Vvedenskii demonstrated that reflex excitation of motoneurons of the extremities’ flexor muscles is accompanied by inhibition of the motoneurons of these muscles’ anatomical antagonists, the extensor muscles, and vice versa. Antagonistic interrelations may also be manifested by reflexes belonging to different functional systems; for example, respiratory movements are briefly halted during swallowing. The great importance of inhibition in the coordinating function of the CNS may be clearly shown by injecting an experimental animal with strychnine, which temporarily deprives the CNS of its ability to develop inhibition. The coordination of reflexes disappears almost entirely in the animal: any local stimulation elicits a simultaneous motor reaction by all the muscles of the body. Sechenov and the Dutch physiologist R. Magnus discovered the importance of the original functional condition of the CNS with regard to its coordinating activity. 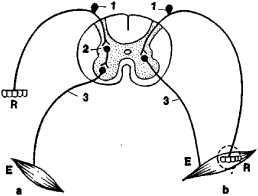 Stimulation of a given receptive field of an animal’s hind leg after transection of its spinal cord induces contrary effects, depending on the original condition of the stimulated extremity. If the extremity is extended, stimulation elicits the flexor reflex, and if the extremity is flexed, stimulation elicits the extensor reflex. The original position of the extremity is reflected in the corresponding nerve center through the excitation of appropriate skin and muscle neural pathways; as a result, the functional condition of the center changes. The receptors embedded in the effectors, and particularly in the motor apparatus, inform the adequate structures of the CNS about the original condition of the effector at rest and also about the nature, intensity, duration, and dynamics of the effector’s activity. The continuous flow of information from the receptors of functioning effectors plays an important part in the adjustment and self-regulation of activity according to the current needs of the organism and the given situation confronting it. Physiologists have long been aware of the important role played in the CNS by this important principle of reflex self-regulation of functions. Designated by the term “feedback,” it eventually became a fundamental principle of cybernetics. The unique circular interaction between the central and peripheral elements of a reflex arc is sometimes manifested by mutual activation and sometimes by a circular rotation of excitation within the elements of the arc. This circular interaction is also manifested by the formation of a special chain of reflexes: reflex contraction of a muscle stimulates its receptors, which in turn cause new reflex contraction of the same muscle (C. Bell, A. F. Samoilov). Circular interaction also occurs among the neurons of the central element of a reflex arc and is manifested in different forms. An example is the phenomenon known as Renshaw inhibition, named after the American neurophysiologist B. Renshaw. In this phenomenon, the axon of a spinal motoneuron sends a recurrent collateral to the spinal cord that is brought into contact with the same motoneuron by an inhibitory interneuron and that inhibits this motoneuron if it becomes excessively excited. This phenomenon of negative feedback was described in relation to the pyramidal nerve cells of the cerebral cortex and to the cells of other CNS structures. An example of positive feedback is the phenomenon of steadily intensifying nerve excitation, described by the Spanish physiologist R. Lorente de No. This phenomenon is caused by the prolonged circulation of excitation in a multibranched closed circuit of neurons in the reflex center: the recurrent collateral of one of these neurons comes into contact with one or more interneurons. These interneurons, when they come into contact with the original neuron, close the circuit and form the structural foundation for repeated circulation of excitation and for a unique type of self-intensification. The coordinated and the antagonistic interactions of reflexes are inseparably connected and constitute different aspects of a single coordinating process. When there is an inherent common terminal pathway, the coordinated reflexes are cumulative and intensify one another. The antagonistic reflexes, on the other hand, engage in conflict over this pathway, and the overcoming reflex inhibits its rivals for a certain period of time. In certain situations, for example, under the influence of such external or internal factors as local mechanical pressure, a hormone, a toxin, or a polarizing current, the excitability of the central mechanism of a reflex increases substantially and evenly, and this mechanism temporarily becomes a unique common terminal pathway. When the receptive fields of heterogeneous reflexes are stimulated, rather than the reflexes specific to these fields, the result is the onset or intensification of a reflex whose center had previously experienced intensified excitation. This type of coordination of reflexes was identified and studied in several modifications that are referred to in modern neurophysiology as the facilitation of pathways, the summation reflex, attenuation, and the dominant. It is believed that the neural center, when in a state of increased excitability or stimulation, inhibits certain elements of the central structures of different reflexes. It also diverts excitation traveling along the initial elements of the reflex arc from the usual route, as though attracting them to itself. Finally, it comes to a culmination with its own excitation and initiates or intensifies a reflex that is of importance for the organism at the moment. The coordination of reflexes also depends on the functional condition of their central mechanism. For example, a decrease in this mechanism’s excitability owing to fatigue, neurohumoral factors, or toxins causes even previously dominant reflexes readily to yield the common terminal pathway to other reflexes. Thus, the diverse forms of coordination of reflexes, like the coordinating activity of the CNS in general, are based on active neural processes that have opposing effects. These include excitation and inhibition, different combinations and variations of the distribution of excitation and inhibition in highly complex macrostruc-tural and microstructural elements of the CNS, complex dynamics, mutual penetration, and the conflict and interaction among these processes. Subordination, specialization, and localization of functions. CNS activity is characterized by functional subordination, that is, a hierarchical ranking of the system’s divisions that has evolved over a long period of time. This hierarchical ranking, as well as the CNS’s structural heterogeneity and functional inequality, are manifested at relatively early stages in the historical development of organisms. The central neural formations and the receptors of the head develop earlier than those in other parts of the body. The main division of the CNS develops by means of the enlargement of its mass, by continuous structural differentiation, and by functional specialization of the system’s existing divisions. The CNS’s main division also develops by means of the constant emergence within it of new central formations whose reflex activity is at a continuously higher level and of continuously greater significance; these formations direct and regulate the activity of all the lower divisions of the CNS. This process of the continuous development, specialization, localization, and subordination of the CNS functions reaches its most complex level in higher mammals and particularly in anthropoid apes and man. The CNS is in a state of tonus even when there are no visible external signs of its activity. Tonic excitation of the CNS is a manifestation of a general functional readiness for the initiation and continuation of activity. The subordination of structures, particularly in the medulla oblongata, mesencephalon, and diencephalon, may be clearly detected in the tonic excitation of the CNS. In higher animals, for example, surgical transection or cryogenic block of the pathways between the medulla oblongata and the spinal cord (that is, the halting of the subordinating influence of the medulla oblongata on the spinal cord) results in spinal shock—a deep and prolonged inhibition of spinal reflexes. A consequence of such transection at the level of the superior colliculi is the phenomenon of decerebrate rigidity, that is, a strong tonic contraction of all the extensor muscles and loss of the animal’s ability to assume or maintain its normal posture. Subordination among the divisions of the CNS is even more evident during their activity. Each higher element of the CNS effects reflexes that are increasingly complex in terms of structure and composition and integrates them more completely, while also involving in its activity the reflexes that are regulated by the CNS’s lower elements. The characteristics of the reflex activity of the main divisions of the CNS may be described as follows. Reflexes of segments of the spinal cord involve only individual parts of the body, such as the extremities. The more complex reflexes of the medulla oblongata extend to the digestive, respiratory, cardiovascular, and motor systems. Mesencephalic reflexes involve the body’s entire skeletal musculature and coordinate such complex motor functions as standing and walking. The reflexes of the diencephalic structures regulate and coordinate the activity of the internal organs of all the body’s systems in every possible combination and in harmony with their vital unconditioned reflexes, for example, the food-grasping, defensive, and sexual reflexes. The cerebral hemispheres are capable of improving all these reflexes, combining them into complexes of reflexes, and creating qualitatively new types of reflexes—conditioned reflexes. Thus, the higher the level of an animal’s development and the higher the level of its CNS’s organization, the greater the dominance of the higher divisions over the lower ones and the more significant their participation in the regulation of the organism’s functions. The increasing importance of the higher CNS divisions over the course of evolution in the organism’s life processes is called the cerebralization, encephalization, or corticalization of functions. However, the lower divisions of the CNS also influence the higher ones, and all information from the external and internal organs is gradually transmitted upward. Therefore, the phenomenon of subordination of the CNS must be regarded simply as an expression of the prevalent direction in the complex and varied interaction among the neural structures of different levels. For example, the reticular formation strongly stimulates and inhibits the functional condition of almost all parts of the CNS, including the cerebral cortex. In turn, the cerebral cortex influences the functional condition and the activity of the reticular formation and other deep-lying brain structures, including the intermediate ganglia of the ascending tracts, thereby regulating the flow of information they transmit. The circular interaction between the CNS structures as well as the self-regulation of their functions confirms the soundness of Pavlov’s view that the cerebral cortex plays a major role in the combined and integrative activity of the entire CNS. The structural and functional characteristics of the CNS are responsible for the variety and efficiency of the activities it performs to fulfill the organism’s normal needs as well as its requirements for new forms of coordination. The abundant reserve capabilities and compensatory adaptations of the CNS are biologically significant both during the organism’s normal existence and after injury to the peripheral sensory and effector organs, the afferent and efferent nerve structures, and the organs of the CNS itself. Orbeli, L. A. Lektsii po fiziologii nervnoi sistemy, 3rd ed. Moscow-Leningrad, 1938. Ukhtomskii, A. A. Sobr. soch., vol. 1. Leningrad, 1950. Pavlov, I. P. Poln. sobr. soch., 2nd ed., vols. 1–6. Moscow-Leningrad, 1951–52. Vvedenskii, N. E. Poln. sobr. soch., vol. 4. Leningrad, 1953. Sechenov, I. M. Izbr. proizv., vols. 1–2. Moscow, 1952–56. Roitbak, A. I. Bioelektricheskie iavleniia v kore bol’shikh polusharii, parti. Tbilisi, 1955. Beritov, I. S. Obshchaia fiziologiia myshechnoi i nervnoi sistemy, 3rd ed., vol. 2. Moscow, 1966. Samoilov, A. F. Izbr. trudy. Moscow, 1967. Rusinov, V. S. Dominanta: Elektrofiziologicheskie issledovaniia. Moscow, 1969. Asratian, E. A. Ocherki po fiziologii uslovnykh refleksov. Moscow, 1970. Fiziologiia vysshei nervnoi deiatel’nosti, parts 1–2. Moscow, 1970–71. Kostiuk, P. G. Fiziologiia tsentral’noi nervnoi sistemy. Kiev, 1977. Livanov, M. N. Prostranstvennaia organizatsii aprotsessov golovnogo mozga. Moscow, 1972. Rabinovich, M. Ia. Zamykatel’naia funktsiia mozga. Moscow, 1975. The division of the vertebrate nervous system comprising the brain and spinal cord.